Investors are understandably drawn to high-yield stocks, but there's at least one such company to avoid -- along with four superior alternatives. 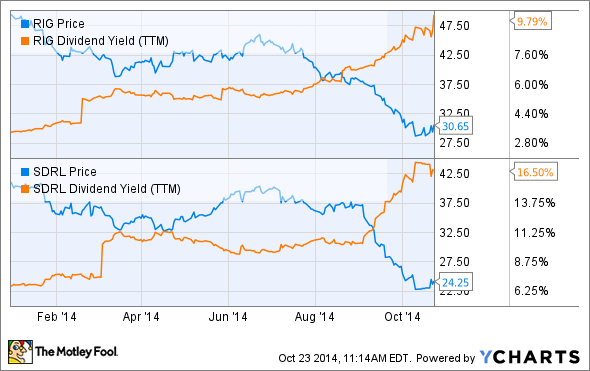 With interest rates still near zero, income investors are hungry for yield. An offshore oil driller such as Transocean (NYSE:RIG), with its mouthwatering double-digit yield, might seem tempting right now. After all, the combination of a weakening offshore drilling market and falling energy prices has resulted in a massive decline in the share prices of Transocean and competitors such as Seadrill (NYSE:SDRL), sending yields on such companies soaring to levels not seen since the financial crisis of 2008-2009. However, I think long-term investors would do best to avoid Transocean and instead look into superior alternatives such as Seadrill, or even monthly high-yield oil and gas MLPs, such as Linn Energy (NASDAQOTH:LINEQ), LinnCo (UNKNOWN:LNCO.DL), or Breitburn Energy Partners (NASDAQOTH:BBEPQ). Here's why. Transocean's high yield is a result of raising its dividend 34% back in May. I disagree with management's decision because of the weakness offshore drilling is facing, combined with some company-specific problems. Those matters make me think the dividend is under threat of a cut over the next few years. Perhaps of most concern is that Transocean is facing one the greatest contract expiration cliffs of any company in its industry. Source: Pacific Drilling May 2014 investor presentation. With only 51% of its fleet contracted through the end of next year, when day rates are expected to bottom out, Transocean faces the prospect of a significant loss of cash flows. The probability of severely reduced day rates for its rigs is made much worse because of its aging fleet, one of the oldest in the industry. Source: Seadrill 42nd Annual Howard Weil Energy Conference presentation. As this chart illustrates. Transocean's fleet of drill ships is, on average, more than four times as old as Seadrill's. Add to this that 21% of the world's offshore rig fleet is currently without a contract and that 68 new rigs are set to be delivered by the end of 2015, and it's no wonder industry executives are expecting the downturn in day rates to continue. In fact, according Seadrill CEO Rune Magnus Lundetrae: "The market is going to be bad this year; it is going to be worse next year. Then it will be stabilizing." Transocean's own CFO, Esa Ikaheimonen, predicts that the ultimate effect will be devastating for day rates, which recently were as high as $650,000 a day for the most state-of-the-art rigs: "You will probably see day rates lower than what I indicated in the [$375,000- to $500,000-per-day] range. ... To me that is the average level where I think the deals will be done." Unfortunately for Transocean, its most recent fleet status report indicates that even Ikaheimonen's prediction of a 43% decline in day rates is overly optimistic. Two of Transocean's most recent contracts, for the Transocean Leader and Amirante, came in at $335,000 a day each, a 16% decline from the previous day rate and 11% below even Ikaheimonen's most conservative estimate. Bank of America analysts are predicting that oil prices will average $85 a barrel in 2015, and with Transocean's latest day rates already so low and the number of its contract expirations so high, I have serious doubts as to the security of its dividend. While Seadrill is sporting a higher dividend yield than Transocean, there are two reasons I believe the dividend is more secure than Transocean's. First, Seadrill's fleet and contract position are far stronger. Specifically, its number of expiring contracts through 2015 is 30%, compared with Transocean's 49%, and its much younger fleet, built on average in 2009, is likely to secure contracts far easier, and for higher day rates than Transocean's rigs, which on average were built in 1981. As this slide illustrates, approximately 20% of Transocean's average drill ships (the industry's highest-margin rigs) are likely to have a hard time securing work. Meanwhile, the utilization rate for the newest rigs, such as those Seadrill operates, is still near 100%. This means higher day rates, which can be seen from Seadrill's most recent contract, for the West Saturn, which was procured in August. The two-year contract with ExxonMobil's Nigerian subsidiary includes a day rate of $633,750 a day, 89% higher than Transocean's most recent contract. The second reason I believe Seadrill's dividend is more secure than Transocean's is its access to alternative financing through its MLPs, North Atlantic Drilling (NYSE:NADL) and Seadrill Partners (NYSE:SDLP). Seadrill can offset the cost of its newer rigs by selling them to its MLPs once a contract has been procured. This sale offsets the cost of the rig and can be used to secure the dividend and pay down debt. Meanwhile, the MLPs, whose cash flows are increased by their new assets, can increase their distributions. That helps Seadrill in two ways. First, Seadrill is a majority owner of both MLPs, so those distribution increases come back to it in the form of higher payouts. Second, the higher distribution triggers the company's incentive distribution rights, which will mean that once North Atlantic's and Seadrill Partners' distributions hit a certain point, 50% of their marginal cash flow will flow back to Seadrill. Thanks to the financial flexibility its MLPs offer, Seadrill's management believes it can sustain its dividend into 2016 even without a significant improvement in the offshore drilling industry. While Transocean recently launched its own MLP, Transocean Partners, it's less able to maximize the benefit of the MLP because of its smaller number of state-of-the-art drill ships. While Seadrill has a fleet of 30 sixth-generation rigs it can drop down to its MLPs, Transocean has just 17. However, five of those aren't set for delivery until 2016 or 2017 and thus unavailable to help secure the dividend over the next 15 months. Sources: Multpl.com, Yaho!o Finance, investor presentations, earnings conference calls. As this table shows, not only are Linn Energy and Breitburn Energy Partners (the two largest oil and gas MLPs) offering higher yields than Transocean, but their distribution coverage ratios are also high enough to mean that those payouts, which are paid monthly, are safe. In addition, both companies aggressively hedge their production to ensure predicable and stable distributable cash flow, which funds the payout. So even with oil price's recent 20% decline, the cash flows and payouts at these partnerships and companies are safe for the next several quarters. For example, as the next slide shows, 88% of Linn Energy's cash flows are secure through the end of 2016, and given its distribution coverage ratio of 1.1, a result of its recent acquisitions and asset trades, its payout is unlikely to be cut anytime soon. In addition, both Breitburn and Linn Energy are masters of accretive acquisitions, which they use to increase their reserves, production, and distributions/dividends. For example, Breitburn Energy Partners recently acquired competitor QR Energy (UNKNOWN:QRE.DL) for $3 billion. The deal increases the partnership's exposure to higher-margin oil and increased its reserves and production by 51%, and 55%, respectively. Meanwhile, according to CEO Mark Ellis, Linn Energy, whose recent asset swaps and acquisitions have reduced its capital expenditures by $550 million to $650 million per year, has stated that it's looking for further acquisitions to grow the dividend/distribution now that it's replaced many of its high-cost, high-decline assets with cheaper, slow-decline acreage. Income investors may be attracted to Transocean's high yield but should be aware that its dividend faces many risks in the years to come. Those include an aging fleet, a massive contract expiration cliff, and worsening industry conditions that will make sustaining the dividend until day rates improve challenging, if not impossible. Competitor Seadrill, thanks to its much larger fleet of state-of-the-art rigs and the alternative financing options represented by its two MLPs, is, in my opinion, a far safer income choice and offers a higher dividend yield to boot. Meanwhile, oil and gas MLPs such as Linn Energy, its non-MLP alternative LinnCo, and Breitburn Energy Partners offer higher and safer yields than Transocean and also have the benefit of paying monthly dividends/distributions that are likely to grow over time.